am ready! Here's a birthday card I made for my daughter's friend. Tomorrow is her birthday celebration and while DD is at the party I get to hang out with a few other Mom's at a nearby cafe. Yeah! AMY!!! That little rub-on is absolutely darling!!! I love it! This card with so sweet with that gingham paper!!! Thanks for sharing! Such a sweet card! Have a great weekend! What an adorable card! I love the background behind that cute image. Thanks for joining us at Aud Sentiments. Awe...this is too cute; love the color combo. What a FAB idea to create a flower! Super cute card for your daughter's friend and love the idea of hanging out with the other Mum's. Very cute little image and GREAT use of the OTWC colors this week! Thanks for playing along! Super cute card!!! Thanks for playing at OTWC this week!!! 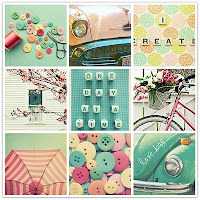 This is really sweet, love your little image and gorgeous papers. Thanks for playing along at Crafty Sentiments Designs this week. 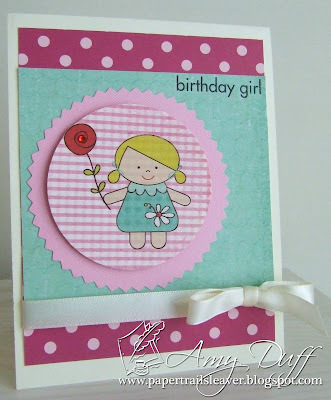 So cute, loving the combo of the gingham and polka dots. Thanks for sharing this with OTWC.